Savagely funny, and newly released. All Evelyn has ever wanted is to please her mother; all Barbara, Evelyn’s mother, has ever wanted is for Evelyn to be accepted into elite Eastern society. Barbara doesn’t care whether Evelyn is well read, but she had sure as hell better know which spoon to use, and what to wear to every occasion…and most of all, she had better know “everybody who’s anybody”. In other words, Clifford’s skewer of high society hits the mark in ways both wry and hilarious. This terribly amusing little tale goes on sale August 18—oh wait, was my rhyme a trifle tacky? Anyway, you can buy it soon, or you can order it in advance, but I was lucky and got a copy free from Net Galley and St. Martin’s Press for this humble review. Thank you to both of them. 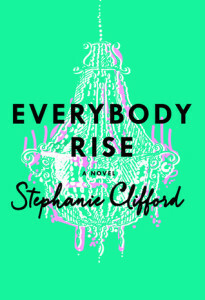 This entry was posted in Uncategorized and tagged beach reads, book blogger, Everybody Rise review, fiction, social caste, social class in USA, social commentary by seattlebookmama. Bookmark the permalink.